Fed up with asking for directions in a bustling metropolis, especially when you are in a tearing hurry â€“ trying to locate a business or spot an ATM? Well, you need not worry any more. Even as cities are expanding fast, poor urban planning continues to plague us and it's now time to act smart when you try to find your destination. Stop looking for those primitive landmarks or asking every second man on the street. Bangalore-based start-up VidTeq has leveraged the video map technology to come up with a comprehensive solution that makes navigation a breeze and consequently, saves time and efforts. So that you will never miss that vital interview or be late for that crucial presentation. Simply put, VidTeq offers videos maps of selected cities, so that you get most accurate driving directions, along with geo-tagging. In fact, the company has developed proprietary software for geo-tagging the videos, while data capture is done with the help of vehicle-mounted cameras. In addition, you will also find digital maps and a search database for navigation and locational needs. Recently, VidTeq has added a 'brand locator' to its digital maps, which includes around 80 brands in Bangalore, such as McDonald's, KFC, Cafe Coffee Day, Levi's and the Big Bazaar stores. This not only benefits the man on the street but also ensures an up-to-date B2C information flow that will help businesses grow. But why did the company choose video mapping in the first place? "Well, when we came back from the USA, we were surprised to find how difficult it was to locate a place, unless it's next to some major landmarks," recalls VidTeq co-founder Ravi Narala. "There was not a single place that could help us know the city (Bangalore) better, in terms of directions. That's when we felt the need to have an organised video-mapping system in place." Asked why the name VidTeq has been chosen for a video-mapping business, Narala says, "We have tried a couple of other names, but soon realised that we are a technology company and not a map company. And we want to bring in this new map experience to people with the help of video clips. Video is something we thrive upon and that's how we arrived at VidTeq." 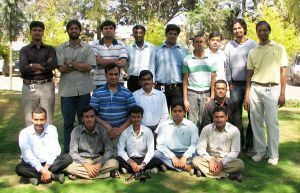 VidTeq was started in 2008, by Narala and his two friends â€“ Muraleedhara Navada and Chandra Thimmannagari. They were college mates in the USA and later, worked together in US companies. In order to raise the initial capital, the trio pitched their business model to close friends and relatives. Eventually, they managed to source half the amount from them and the rest came from their savings. Narala holds an engineering degree in Electronics from Manipal Institute of Technology and a Master's degree in Science & Electrical Engineering from the University of North Carolina. He had also worked with Qualcomm India, Texas Instrument India, MX-COM, Inc. (USA) and Analog Devices, Inc. (USA). He has 15 years of experience in chip designing and another three years of exposure as an entrepreneur. Just like any other start-up, VidTeq had to overcome initial problems â€“ right from funding to setting up a workable office and revenue generation. Although Narala has not disclosed the initial investment into the company, he readily talks about other issues like finding a suitable office space. "Getting the right kind of office was really difficult because of the capital constraints. Most of the people asked for a huge advance, which did not suit us. For a budding entrepreneur, capital is the key and one can't lock the money in office rent. But during our search, we found Evoma, a company which provides serviced offices in Bangalore. Essentially, you get the entire infrastructure ready and you can just plug in your laptop and start working. Evoma only asks only for two months' advance and the rent depends on the number of seats, without any long-term commitment. We also got a very, very attractive price; that's why we are still here," adds Narala. Getting the first paid customer was a bit difficult, too. Although the product was appreciated by all, customers were not convinced when it came to paying for a video, which gives direction. They went on asking numerous questions as to how it would help their businesses grow and so forth. "But finally, we managed to get Salarpuria, a leading real estate company, as our first paid customer. We convinced them that there's only a meagre price component attached to the product," recalls Narala. "As we began interacting with numerous customers, we learnt the importance of making a customised sales pitch that will meet specific requirements. For instance, when we approached the Canadian International School, we made a sales pitch that highlighted the numerous calls the school used to receive from parents during admission. We told them it was too tedious to attend each call and give directions to every individual. But after the installation of the VidTeq product, the number of calls have dropped drastically," points out Narala. However, as far as banks and other financial institutions are concerned, no help was available for setting up the initiative. "It's always said that banks encourage new companies. But it's just on papers and certain banks are not even aware of the current schemes. Whenever we enquired, they said that our query had been forwarded to the corporate headquarters and it would take another six months to get a reply. All I can say is â€“ it's not easy to raise money through banks, unless you can offer collateral," says Narala. The company faced further problems with hiring. According to Narala, young people in India mostly want to work with big brands. In order to find the right talent, we went to start-up forums and enquired about the talent pool. Finally, we managed to get five good engineering hands who believed in what we were doing. Once the office was ready, it took the video-mapping company another 16 months to build a complete video map of Bangalore. Since the new venture was subject to various rules and regulations regarding privacy concerns, it had to get a no-objection/clearance certificate from the state home ministry before the mapping could start. 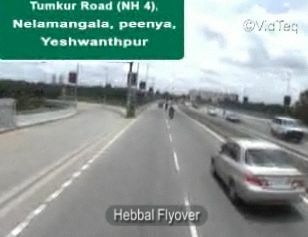 But once the formalities were complete, Versa cars with cameras hit the Bangalore roads to map the city. There were 25 contract employees on field to gather the data. "Normally, it doesn't take more than three months to map a city. But initially, it was a lengthy affair as the company was also developing the geo-tagging technology, along with the mapping, says Narala. The entire process of video map creation calls for extensive outdoor work and hi-end technology treatment. The company has a video capture team who collects the data by using vehicle-mounted cameras. What they get is the raw video, which then goes through the stabilisation process and finally gets delivered to the media team for editing. Once edited, the video clips are geo-tagged and then stored. Moreover, the company has built a whole set of proprietary tools to handle the complete process of geo-tagging the video clips. The video clips produced by VidTeq are not only used for navigation but are also useful for locating relevant businesses and exploring city streets â€“ all available right there on your computer screen. Then, there is information on businesses/points of interest (along with their exact locations), plus images, embedded right into the videos and also the digital map. Businesses subscribing to VidTeq mostly include educational institutions, healthcare facilities, real estate companies, restaurants, resorts and other businesses with large customer footfalls, as they rely on the video map to attract even more consumers. Till date, VidTeq has successfully mapped Bangalore and Mysore, and work is currently under way in Chennai. VidTeq has introduced a number of products to meet specific requirements of various businesses. For instance, there is Wayfinder that provides simple direction to a particular business. Directional SMSes are also there to make navigation a breeze. Organisations like educational institutions and healthcare facilities mostly subscribe to this service at an annual fee of Rs 50,000. Store Locator is another essential tool that helps both businesses and consumers. Even big brands with multiple branches/franchises spread across the city don't have the means to keep a customer up-to-date regarding the nearest store. To bridge this gap in information, the Store Locator performs a geospatial search around a customer's location and presents a list sorted by proximity (nearest store listed first). The company also provides video map-based driving directions to any store of customer's choice. Businesses have to pay a monthly subscription fee of Rs 2,000 per location store. However, real estate is the biggest revenue generator for the company. According to Narala, at any point of time, around 800 projects are under various stages of development in Bangalore alone. Although these real estate sites feature some kind of location maps, they happen to be extremely rudimentary, similar to the hand-drawn ones people often come across in wedding cards. So, in order to cater to this segment, VidTeq has developed a product called e-Visit, which enables customers to visit project sites in real time, from the comfort of the living room. The product can be installed at any physical site and anyone accessing the location on the Web, can also access the video. Besides information on the real estate site, VidTeq also provides details about the surrounding areas and the facilities available there, such as schools, hospitals, eateries, parks, shopping malls, retail outlets, technology parks and so on. Such detailed information often helps a prospective buyer to make up his/her mind when it comes to property purchase. In brief, e-Visit is a useful product for real estate developers who want to describe their project locations as well as possible. "Any real estate buyer's major concern is location â€“ what schools are nearby, how is the approach road, where is the nearest hospital, bus stop, grocery store, etc. Our e-Visit product precisely addresses these concerns using our custom VideoMap. These products mostly cater to real estate and hospitality sectors. And companies need to pay Rs 500,000 per annum, per location, to subscribe to this service," says Narala. Incidentally, the subscription model is an important aspect of this business, which has made the investors to look at the model closely, he adds. At present, the company has 150 dedicated customers and has posted a turnover of Rs 2 crore in the third year. "We did amass Rs 20 lakh in the first year and Rs 1 crore in the second year. Currently, we are growing at 200-300 per cent and we plan to touch Rs 5 crore by March next year. As we add one city after another, there will be a subsequent increase in revenue, comments Narala. The new venture and its products may sound quite unique, but what about the competition from digital map makers like MapMyIndia or SatNav? "I don't think there is much competition that way," says Narala. "They are more like domain partners and they mostly offer consumer-end, product-oriented business models. They sell digital maps to GPS navigation system makers like Magellan and others. In order to follow our business model, they need to get GPS devices from third party vendors, install the digital maps and sell them to end-consumers." But unlike other models, VidTeq only targets businesses and the beneficiaries happen to the common people. "As of now, we will continue to focus on the B2B space. But in the near future, we may try and get into B2C via the mobile platform," Narala elaborates the company's action plan for scaling up. For VidTeq, venture capital interaction started even before the start-up took a concrete shape. But most of the times, the question happened to be â€“ how would you monetise? "VCs assume that all start-ups are run by smart people and execution won't be a problem. They are more concerned about how you will build the company around the idea and make it profitable," explains Narala. "However, we at VidTeq have never chased venture capital," he continues. "I believe VC money comes when we are not desperate. That's what we have learnt from our experience. Funding will come as growth capital and not as seed capital." The company has already raised $500,000 from Bangalore-based, Karnataka Information Technology Venture Capital Fund-2 (KITVEN Fund), promoted by the Karnataka State Industrial Infrastructure Development Corporation, Karnataka State Finance Corporation and Small Industries Development Bank of India. When asked about fund deployment, Narala says that it has been partially done and should be complete by August, 2012. The proceeds will be utilised to map at least three more cities â€“ Chennai, Pune/Mumbai and Hyderabad. VidTeq is also developing corporate products and may soon provide video map solutions for cab routing, vendor tracking, interviews and expat visiting. These solutions can be accessed through company Websites and intranets. The tech start-up is also into R&D, as it is keen to expand into mobile space and targets top devices like the iPhone and android phones. VidTeq will also increase its headcount to 50 from the current 25 employees and plans to shift to a new office. These are, undoubtedly, ambitious plans. So, will the company require more funding in the coming days? "We would like to go for another round when we get into mobile space," affirms Narala. "We will need a bigger partner and more money to reach out to end-users. At that time, we will definitely need capital, but it will take us another 18-24 months to reach that phase," he concludes.